Extracts of the active ingredients from the Cannabis sativa plant are now common options for various applications, particularly in the medical community in certain states in the United States, and Canada. Cannabis oil extracts can be further processed to make standard extracts, concentrates, oils, THC distillate oil, CBD oil, or solids for application like those for medical marijuana in the form of edibles, vape oil, or topical applications. For manufacturers of cannabis products, proper filtration is crucial to producing high-quality, pure, and safe cannabis extracts and cannabis products. The filtration stage of producing essential cannabis oil, wax, shatter, concentrate, or distillate, including medical marijuana and hemp oil, is key to ensuring product safety and quality – regardless of the desired result.Reliable cannabis extract producers of medical-grade marijuana and hemp oil turn to precision equipment to achieve excellence in every aspect of the liquid product, from distillation, taste, and smell, to an appealing appearance. The right combination of proper techniques and tools is the difference between a clear, amber extract, and a muddy, undesirable product that contains plant particles, debris, and unwanted lipids. The filtration methods used, and the extent to which they are used, vary based on the desired quality of the end product, as well as the type of product. If done properly, this step eliminates the need for excessive filtration early in the process. 1. Crude extraction comes next, a process that usually blends a solvent like ethanol, CO2, butane, or propane with the crude extract to liquefy the product. Each liquid is used for a different end-product or to abide by local laws. a. For example, extractions using cold ethanol are usually only used to make distillate oil—not shatters, crumbles, or waxes. The resulting clear or light amber oil can be used for vaping applications, but ethanol is also used in cities that restrict the use of manufacturing processes with volatile chemicals like propane. For larger processes, one batch may include 100-200 pounds of plant material, and 100 gallons of ethanol. b. Propane, when allowed, is cleaner than butane processes, and can cut the extraction process in alf, but is not as commonly used as ethanol extraction. c. CO2 provides the cleanest extraction. However, the systems are very costly, operate under very high pressure, and take the longest to extract. 2.The desired result is a solvent saturated with cannabinoids; the oils have dissolved from the plant material into the solvent. 3.For butane, propane, or CO2 solvents, the next step is winterization, or freezing for solvent removal. When extracting with cold ethanol, winterization is not necessary due to the extremely low temperatures. Winterization in a commercial production setting normally involves lowering temperatures to between -40 degrees Celsius, to -80, for 12-16 hours. a. This process freezes the lipids and fats in the crude product, and is not required with an ethanol solvent. The reason that other solvents need winterization is that butane, or BHO, unlike ethanol, is non-polar and therefore dissolves excessive plant material, which is removed via winterization. b. 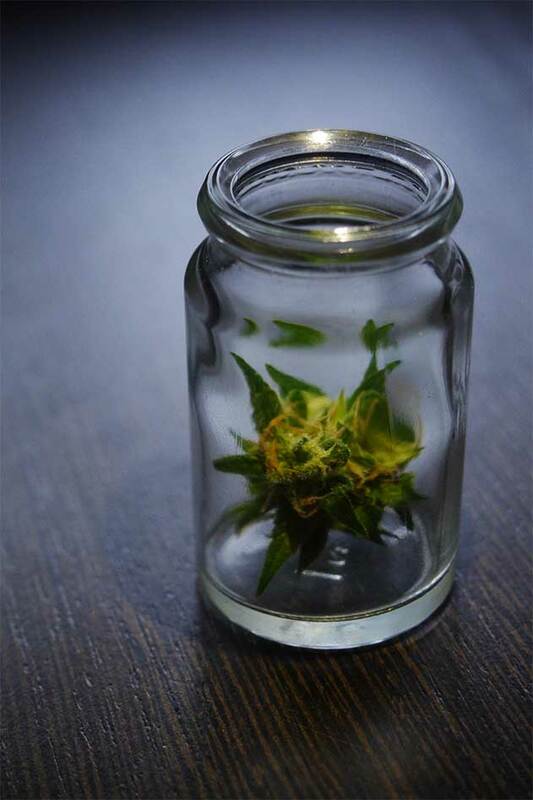 After freezing, the product should be filtered immediately through an activated carbon- impregnated filter media to remove particulates, color due to chlorophyll, and any excessive terpenes. Filtration is an essential step in making cannabinoid products, because it stabilizes the cannabinoid complex. Failure to filter can result in degradation of the cannabinoid complex and potency. Filtration needs to occur quickly to not expose the slurry to extended periods of O2 or light, which can also cause degradation of the cannabinoids. Running the slurry through an initial filter stack within a lenticular housing after extraction aids in maintaining the integrity of the product. Most processes then pump the liquid through a filter that catches particles and biomass, and finally multiple, smaller filter media grades as many times as necessary to finalize the product and remove unwanted compounds. For example, some productions first filter crude product through a 25 microns filter media to remove large particles. The filter process then moves down to 10 or 5 microns and finer porosity filter media to ensure purification. It is common to use a 2 stage filter process, with carbon filter in the first step, and Diatomaceous Earth in the second step. The muddy, dark brown or green appearance in the raw extract comes from the presence of chlorophyll, which also has an undesirably bitter taste and an unstable material. The presence of chlorophyll can cause degradation of cannabinoids and can compromise the integrity of the end product. Carbon removes most of the unwanted chlorophyll and pigmentation. Activated carbon filtration effectively adjusts the color and taste of your product without affecting the integrity of the product. Carbon filter media can remove excessive terpenes as well. Filter media with DE is the second step in the process. VolumeFiltration and extraction, when executed precisely, shouldn’t impact volume on a grand scale. Pay special attention to proper extraction processes, keeping a clean trim, ensure that the flower hasn’t been contaminated, and carefully monitor temperature to keep volume and yield within the desired range. In winterization, the temperature needs to reach at least -65 Fahrenheit to ensure that the undesirable elements of the slurry are separated from the desirable ones. PotencyPotency, or the amount of CBD or THC, while it can be affected by the extraction or distillation processes, is NOT impacted by a certified filtration process. However, monitor distillation closely so as not to lose potency. Filtration can in fact aid in maintaining the integrity and potency of cannabinoids, because it removes unstable materials like chlorophyll and wax. The results above were achieved solely through activated carbon filtration, using ErtelAlsop’s Micro-Clear MC35C activated carbon filter media. Depth filter media with a porosity as low as 0.45 micron retention finishes your product by removing fine particles and debris that can affect purity and appearance, and prepares it for final processing or bottling. Allows the removal of excess color and odor from liquids without having to deal with carbon in loose form. A mineral free depth filter sheet for efficient removal of particles. Precision purity, clarity, and high throughput Diatomaceous Earth filter aid impregnated depth filter media. Unparalleled process control, manufactured specifically for critical applications. Outperforms standard grades by over 500%. Buchner filters have been commonly used to filter liquids in cannabis product manufacturing, but are no longer the standard for larger, high-quality operations. Large volume throughput works better with high-volume filter media cartridges and lenticular housings. From research and development applications in the laboratory, to full production runs, ErtelAlsop’s food- and pharmaceutical-grade depth filters, equipment, and filter media are staples for producers looking for a professional result. As with all ErtelAlsop filtration equipment, you’ll find the right filter media paper and equipment for your specific operating conditions. ErtelAlsop offers the widest varieties of filter media and construction techniques to provide good particle retention, clear filtrate, high flow rates, and dry filter cakes, with our variety of filter media finishes and separation capabilities. To learn more about ErtelAlsop’s filtration options and product testing capabilities, contact us at (845) 331-4552.